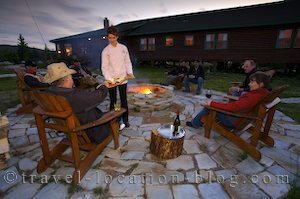 A busy day photographing with the staff of Rifflin'Hitch Lodge ends with a gathering and drinks around the firepit. Rifflin'Hitch Lodge in Southern Labrador, Canada. Breakfast is served each morning in the dining room of Rifflin'Hitch Lodge at 8:00am and guests are beckoned to the table by a series of tolls on the bell. After breakfast, we started organising photography locations around the lodge and further scouting of new locations. We had a long list of things that needed to be photographed including food, fishermen fishing .... and catching, plus a special evening shot where the scene needed to be tidied up. A lot went in to the preparations. It was a fine day so we had to make the most of it. There is one little thing that is never really gets a full mention when reading about travelling to Labrador - that is the flies! You cannot fully appreciate the impact of these small winged creatures until you've visited Labrador. Although there is the usual distribution of mozzies (mosquitoes) which can be a source of annoyance from their constant buzzing around bare limbs and ears - they are not nearly as nasty as the black flies. These guys literally take chunks out of you. After shooting an outside scene which took around 10 minutes we returned to the lodge with blood running everywhere - ears, scalps, anything bare. These bites, for some of us, turn into beautiful purple welts which look really attractive .... not! All you really need is to be prepared with plenty of fly dope (fly repellant) and/or a net hat and gloves - basically cover up! Problem is they tend to come out when it's fine and sunny and that's when we want to be out there. At around 4pm Rolf took off with Darin in the Helicopter to photograph guests fishing at the White Bear River Falls - a beautiful setting, but difficult to photograph. He ended up wading out in the river which has a base of slippery rocks, to shoot back towards the fishermen. At times his camera was only a matter of inches from the water surface which also meant the water was about an inch from the top of his waders. After a couple of hours they returned to the lodge and we got set up for the food shots and Chef Nancy Elliot had a great line up on the menu ... again! After dinner, we got into position for the evening shot - around the firepit. The guests joined us out around the fireplace which added to the atmosphere with their chatter and laughs. Releasing everyone from their modeling duties, we finished off with some blue hour shots and drank the rest of the wine and cheese - shouldn't be left to go to waste .... right??! !